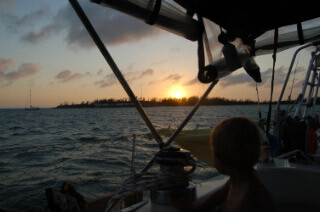 We spent the last night outside of Normans Cay enjoying about 180 degree easterly protection (if the wind blew from the North through East to South we were safe behind protective land). 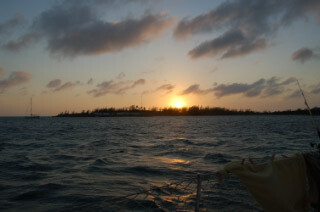 There were a few swells early on but they settled down and we had a good night in what is becoming one of our favorite little spots to anchor. Today we decide to move inside the islands so we’ll be closer to the abandoned dock and a cistern full of free water that is rumored to exist on the island. 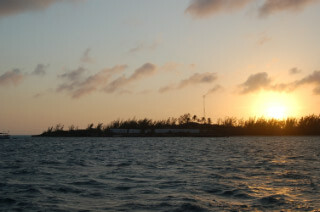 On the island are many abandoned buildings, a derelict air strip and a couple of cottages which have lights on at night. One of the buildings is McDuff’s, a former cruiser hangout with burgers and beers in the middle of nowhere. A sign says that its under new ownership and will reopen in November. We meet cruisers who say that sign was there last year too. So perhaps the sign refers to a few more Novembers (the renovation is apparently on island time). Many of the other abandoned buildings are part of the compound of drug lord Carlos Lehder. There’s an old Toyota that looks like it may still work and one single Bahamian zipping around on a motorscooter. But there are no other signs of life. At the top of the hill is the restaurant/bar/main HQ of Carlos’s operation. And there is supposed to be a cistern there where one can get free water. We dinghy to the beach with our laundry and jerry jugs and climb the mortar stairs to the shell of building with one of the world’s best views… and no windows to get in the way of the view as they have all been broken out as has everything else that might have held any value here in the islands. I look around for the cistern and find a small cinderblock chimney-like structure covered over with a ratty old piece of plywood. In barely legible hand painted red letters it says “Drinkable Water – Please keep covered”. I slide the plywood back and stare down into a pit. About five feet down is the surface of three feet of clear water along with a few rusty pipes and old cinderblocks. I’m sure we can kill anything that might be living in the water with bleach but who knows what else is down there leaching into the water. I think we’ll use this only for laundry and filling the sunshowers. I fill two five-gallon jugs and buckets for laundry and trudge down the mortar stairs. Megan takes the buckets and sets to work with the boys doing the laundry “old school” at the base of the stairs. We’ve stepped back a century. I dinghy to the boat fill the sunshowers, dump the rest of the good water that we have in jerry jugs on the rail into our main tanks, and head back with another 20 gallons of empty jugs. Michael dinghies over later in the day and picks me up to dive on the submerged plane that pokes out of the water in the harbor. From the surface I had no idea how substantial it is. The engines are about 6 feet in diameter with enormous intact rotors. Groupers are rumored to live in the engine but I don’t see anything bigger than a few speedy schoolmasters that are too quick for my limited pole-spearing skills. Coral has begun to take hold along the fuselage and it looks like this wreck will someday become a reef. Back at the boat, I am greeted by the foul odor emanating from the plumbing for the head (toilet). I investigate and find the holding tank through which “everything” passes is backing up. So another glamorous day of the cruising life… I get to dive into a hot cockpit locker, clean out the “contents” that are plugging up the tank, then clean myself of anything that might have splashed on me. Oh, the joys of living on a boat! But the beautiful sunset that follows makes up for it all and then some.